There are seven price plot styles to choose from and each has its own unique properties that you can control. Chart price plots are the most basic part of technical analysis. It’s important to know what each plot style is, how they differ and why one might be preferable to another. Since Mutual Funds report the NAV (net asset value) only once per day (at the close) the daily chart will always display as a line graph. Short for "Open, High, Low, Close", this plot style shows the open, high, low and closing prices for the selected time frame. 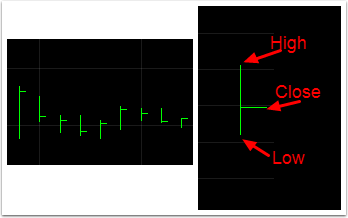 On a daily chart, for example, the vertical line represents the day's range with the top of the line being the high for the day and the bottom being the low. The horizontal bar on the left side represents the day's open and the bar on the right side is the close. For charts other than daily charts, the vertical bar represents the range for the time period (3-day, weekly, etc.) and the open and close lines represent the open and close of the period. 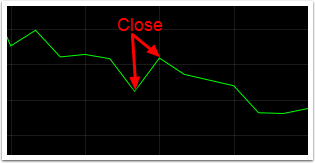 Short for "High, Low, Close", this plot style shows the high, low and closing prices for the selected time frame. On a Weekly chart, for example, the vertical line represents the week's range with the top of the line being the high for the week and the bottom being the low. The horizontal bar represents the week's close. 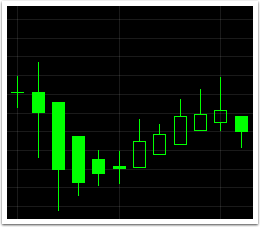 Candlestick charts show the open, high, low, and close for the period (day, week, 15 minute, etc.). The candlestick has two elements, the body and the wick. 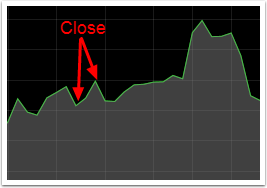 The body is the thick part of the candle and represents the range between the opening and closing prices. Traditionally, if the close is higher than the open, the body will be hollow. Conversely, if the open is higher than the close, the body will be solid. 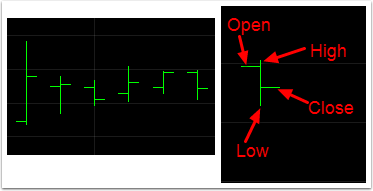 The wick shows the day's range when either the high or the low falls outside the range of the close and the open. Optional: Candlesticks can be colored either on the basis of Net Change or Open-to-Close. 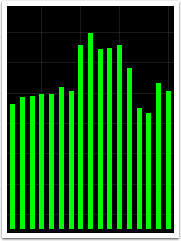 Also known as a "bar graph", this is a chart with rectangular bars which are proportional to the values they represent. This plot is not typically used to plot prices since a Line chart will give you the same information and not clutter up the chart as much. Bar charts are more widely used to plot volume and indicators like a MACD histogram which has values above and below zero. Similar to the Line plot style, except the Area plot style includes a shaded area below the line. According to Investopedia, "The Heiken-Ashi technique is extremely useful for making candlestick charts more readable - trends can be located more easily, and buying opportunities can be spotted at a glance ... When properly used, this technique can help you spot trends and trend changes from which you can profit!" Note: Heikin-Ashi candles are plotted using calculated data, not the actual open, high, low and close data. Read the Investopedia article for details on how they are calculated.